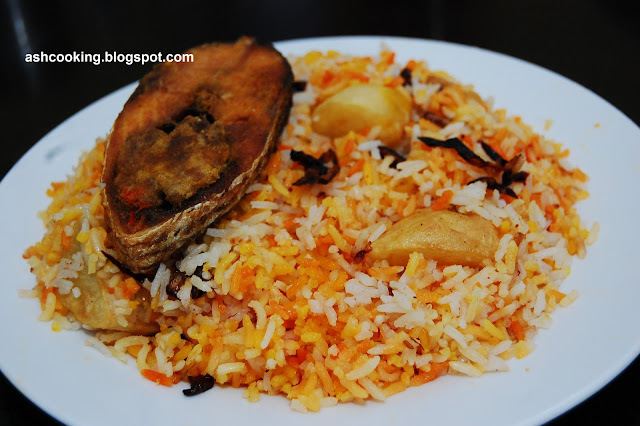 I have been longing to prepare Biriyani for years but somehow could never manage the time and effort required. After the week days spent in a tiring work schedule, finally when I used to get some time for little rest, my mind and body would not work in coordination to make any meal requiring meticulous observance of details. So cooking Biriyani was always out of option. 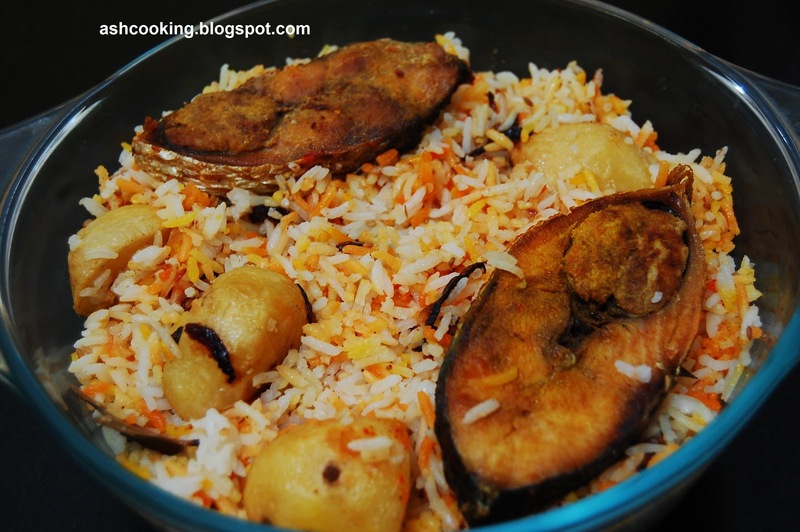 Finally now as I am sitting home without work and spending my days like the way I have never spent in last 4 years, I made my mind to cook it for dinner one night and I began with cooking Hilsa biriyani because the time involved is less than its other counterparts like mutton or chicken biriyani. 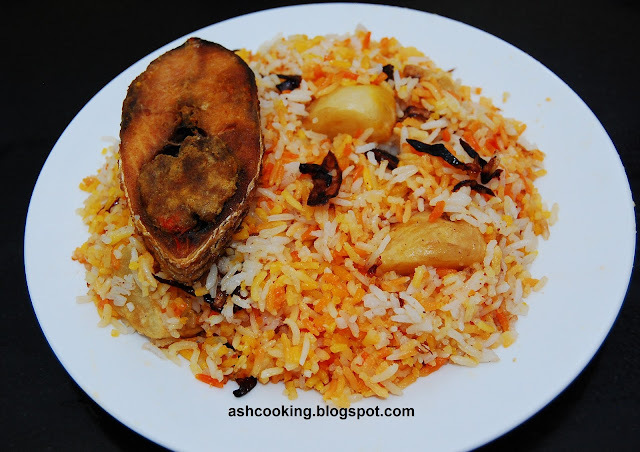 Now one thing that you must keep in mind before you set about cooking any biriyani is that "patience" is a requisite here. Just relax and slowly go about it. Don't make any haste cause a miss in steps can change the taste from brilliant to moderate or bad. 1) Rub salt and turmeric powder on fish pieces. Lightly fry them in smoking hot oil. Reserve 2 tbsp of the oil used in frying fishes. 2) Boil the potatoes in microwave for 5-10 minutes till they become a bit tender. Then brown them in hot oil. Keep aside and fry the onions till they turn brown in color. 3) Cook the rice with bay leaf, cinnamon stick, cardamoms and cumin seeds added into the water used for cooking rice. 4) Grease a large flat-bottomed pan, preferably non-stick, with ghee or oil. Divide the rice into two halves. Add one half of the rice to the pan and spread out with a ladle to make a bed. 5) Sprinkle salt, sugar, 2 pinches of mace powder and nutmeg powder each on the rice bed. 6) In a spoonful of milk, add one pinch of saffron and pour it on the rice. Add half amount of the fried onions and fried potatoes and reserve the rest for the next step. 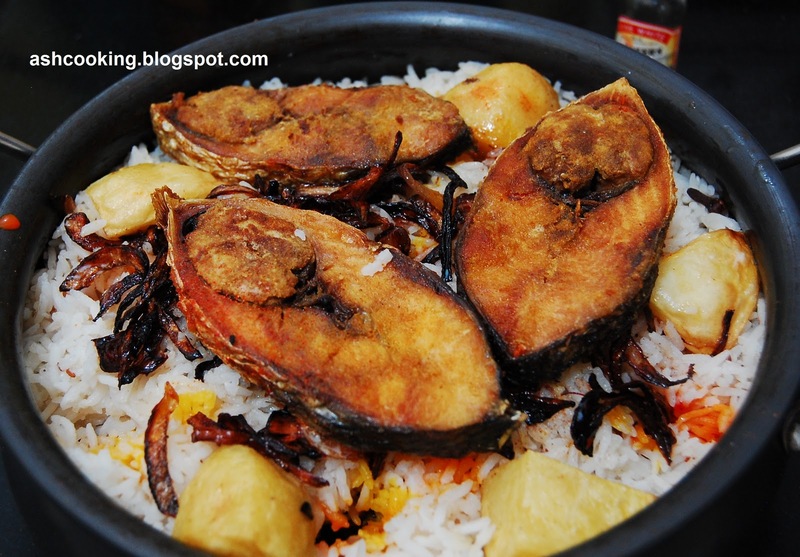 Arrange few fish pieces on top and drizzle the reserved oil that was used for frying fishes. 7) Now add the remaining rice on top of this arrangement. Again diffuse the rice proportionately in all directions to make a bed and repeat steps 5 & 6. Only instead of the reserved oil, use ghee this time and add the fishes after step 8. 8) Mix 3 tsp of rose water with milk and pour 4 ladles of the milk on the rice. Insert your finger into the rice bed to create few holes. Mix food color with a tbsp of milk and pass in the colored milk through the holes. This way color will be distributed asymmetrically giving the rice an attractive appetizing look. After all, you eat a dish with your eyes first before setting teeth on it. 9) Arrange rest of the fishes on top. Now put the pan on flame and lower the heat to minimum. Cook covered for 20 minutes. dear....I loved ur biryani recipe n would love to giv it a try.....just wanted to know do u need so much milk in the recipe as the rice is already cooked be4 ? Yes for giving dum, you need that amount of milk. It would keep the moist in, else during 20 minutes of dum, the rice might become too dry. Lovely!! Never had Ilish biriyani, although I am an Ilish fan. Hi there! Can you post some microwave recipe for fish?? 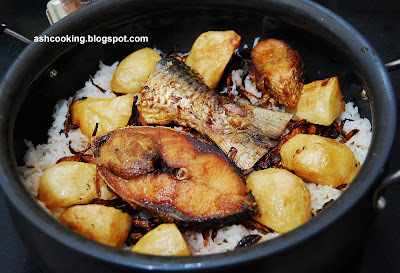 Can you post some microwave recipe of fish??? Loved this recipe. Will try it Soon :) thnx fr sharing.